Comet 302661-A, Secondayr Clutch CLUB CAR PART 101834001, Stens 255-004 Driven Clutch. 7/8" Bore-8-1/4" Dia.-Blue Spring. 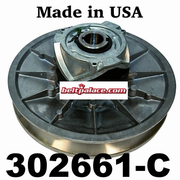 Home > Comet Clutches and Parts > Comet 302661-A, 510 Series Secondary Clutch - 7/8 Bore. 1/4" Keyway. 8-1/4 Dia. Comet 302661-A. 510 DVN - 7/8 B - BLUE SPRING (ONE WRAP). Driven Unit 302661. Comet 302661-A, 510 Series Secondary Clutch - 7/8 Bore. 1/4" Keyway. 8-1/4 Dia. Comet 302661A, 510 Series Secondary Clutch - 7/8 Bore. 1/4" Keyway. 8-1/4 Dia. CLUB CAR PART 101834001(OEM: CLUB CAR DS and Precedent 1997 and newer. Comet-Salsbury Clutch 302661 (A and/or C). IN STOCK! Made in USA by Comet Industries. Comet 301245A. Comet Industries 500 Series Drive Clutch. 1" Bore. Comet 301245A. Comet Industries 500 Series Drive Clutch. 1" Bore. Comet/Salsbury/Brister's Part 301245-A.